The common beech, also known under its Latin name fagus sylvatica is a species of deciduous tree native to large parts of Europe, including the UK. As a specimen tree, common beech can reach great heights, but planted in a hedgerow, this popular native tree will remain relatively small. It is one of the most widely used hedging plants, which is largely caused by its fast growth rate and its appealing green foliage. Even though the fresh green foliage will turn brown and wither in the winter, the dead leaves will remain on the common beech throughout the season, until they are replaced by fresh growth in the spring. This way, despite being deciduous, the common beech provides year-round screening. Beeches in general have a very neat appearance, which makes them perfect for formal hedging. The common beech is often confused with hornbeam or carpinus betulus, which does indeed look fairly similar. The most notable difference can be found in the appearance of their leaves, as hornbeam leaves have serrated leaves rather than the wavy edges of beech leaves. When new foliage appears during springtime, the leaves have a characteristic cigar shape before unfolding. Beech hedges should be allowed to grow no more than 3 metres tall, as the hedge will not only lose its shape, but also its screening capacity when it grows larger. Beech hedges can be pruned as necessary, which usually comes down to trimming your hedge no more than once or twice a year. As the common beech is native to this part of the world, it is used to growing in European conditions. It will happily grow in most soils, including difficult soils, such as chalk, clay and lime, provided that they are well-drained. As a woodland species, common beech prefers a soil rich in humus. Waterlogging is not beneficial to both the health and the appearance of your common beech hedge. In fact, beech hedges will thrive in drier soil. Be sure to water it regularly during the first year, however, as the saplings need plenty of water until they have established. Beech plants are very hardy and capable of tolerating cold winters, as well as exposed locations. A common beech hedge is best planted between October and mid-winter. With an average annual growth rate of 30 to 60 centimetres, it is essential that your common beech hedge is pruned regularly. As stated before, one or two pruning sessions a year should suffice. If you would like your common beech hedge to hold on to its leaves during the winter months, we recommend pruning it in August, though it is also acceptable to trim this type of hedge in the spring. Keep in mind that the planting position of the common beech can impact the autumn colour of its foliage, as its leaves will turn yellow rather than coppery red when your hedge is planted in partial shade. 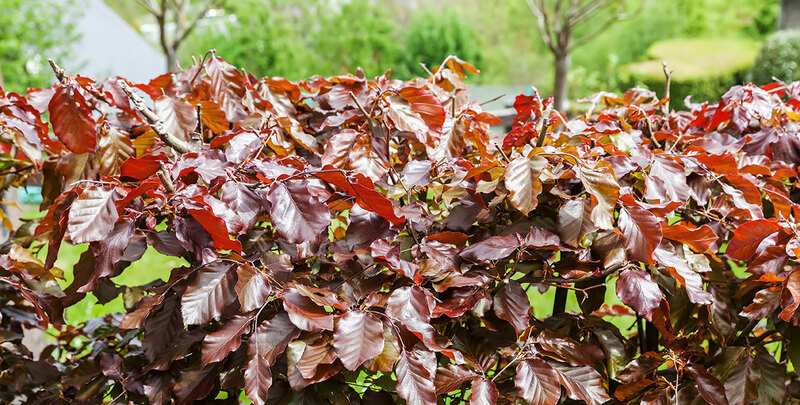 For gardeners who whould like colour all year round, the copper beech is certainly worth looking into. In the unfortunate case that your common beech hedge becomes overgrown, you do not need to worry, as it is possible to restore your hedge’s shape by cutting it back in February. The popularity of the common beech hedge is easily explained by the fact that it combines the best qualities of evergreen and deciduous hedging plants. While the flowers and nuts that the plants produce are rather inconspicuous, they are beneficial to wildlife. Meanwhile, you will be able to enjoy the elegant autumn colour of your common beech hedge during even the winter months, when most other deciduous hedging plants have shed their foliage and, as a result, look rather monotonous. In addition, the fact that these leaves will remain on its branches during the winter means that the common beech provides excellent screening, despite being deciduous. It also provides more shelter to wildlife than most evergreens. The slightly tougher and fairly similar hornbeam would be a better choice if circumstances are challenging, but hornbeam will not look quite as stunning during the cold months.